Inspired and saddened by news headlines, Kathy Crandall made a decision. Crandall is a domestic violence survivor and it was time to share her story in an effort to warn others in abusive relationships. On Thursday, December 13, 2018 Crandall entered a high school classroom to present her story for the first time. Bartl’s 10-12 Health class listened intently as Crandall described the night, thirty years ago, when she survived. Crandall lived with her father, who worked nights, and was alone when her boyfriend showed up at 3 a.m. with a hunting knife, threatened her over a rumor involving their mutual friend George, and left in a rage – returning 45 minutes later with a 22 rifle. On December 13, Kathy Crandall stood, vulnerable, in jeans and a sweater in front of a room full of high school students and laid her pain and fear out for them to feel. 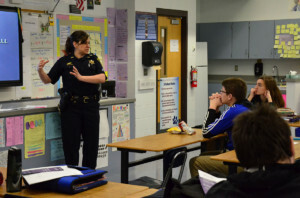 On December 14, Deputy Crandall returned, in full police dress, to empower the same students to recognize warning signs and advocate for themselves, their friends, or family members. Using print resources provided by Willow Domestic Violence Center, Deputy Crandall presented the twenty-two types of relationship abuse to the class. These examples fall within five categories: verbal abuse, emotional abuse, physical abuse, sexual abuse, and economic abuse. She also provided them with resources on who to contact if they are scared or need help. In addition to providing resources for those being abused, Deputy Crandall discussed resources for abusers seeking help. Thirty years ago, Kathy Crandall stayed in an abusive relationship because she was embarrassed, she was afraid her boyfriend might hurt himself, and, mostly, she didn’t know what else to do. Today, she is visiting students, the same age she was, and handing them the tools that might save their lives. Deputy Crandall is a Monroe County Deputy Sheriff working in the Jail Bureau. She also teaches Mental Health, Social Media, and Sexual Harassment at the Police Academy.